Here is a list of Rival Best Paying Slot Machines. At the bottom we’ve added a list of Top Rival Casinos to play and few tightest Rival slots which better be avoided. *If you are from US, please notice that there are only few trusted Rival casinos. You don’t have to pick the ones listed here, but make sure you check before you make a deposit. *If you find our loosest slots list helpful, we would appreciate if you share it with others. Thank you! RTP: 98%. The loosest slot for US players. Cosmic Quest 2 is a 5 reel, 20 lines outer space themed slot. The money is in it’s various bonus features: up to 50 free spins with x2 multiplier; bonus rounds and Expanding wild. RTP: 98%. Nice 5 reel video slot with and edgy rock theme. The best part is the Guitar hero skill based bonus round. Other Rock on slot bonus features include free spins, with up to x10 multiplier, and expanding wilds. RTP: 96%. Fairytale themed video slot with 5 reels, 20 lines and wacky design. Silver Unicorn offers solid payout during the regular play. Bonus features can earn you some extra money: free spins (x3 multiplier), expanding wild and a special bonus round. RTP: 96%. Part of Rival’s famous i-Slots series. Midway Madness is 5 reel, 20 lines, video slot. Free spins, multipliers and a nice interactive Bumper Cars bonus game. Cool cartoon-like design. RTP: 96%. Another Fairytale themed slot. Has less bonus features than the slots above, but it is a simple and nice slot to play. 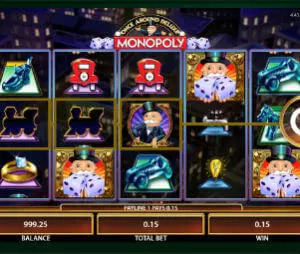 The maximum jackpot is just 5000 coins, but makes up for it with frequent smaller payouts. RTP: 96%. I find Wacky Wedding Slot design a bit too wacky, but that’s jut my taste. The game offers up to 75 free spins with x3 multiplier, Wedding Cake expanding wild and special bonus round. RTP: 96%. Another cool 5 reel i-slot. The wins come from 3 bonus features. Expanding Wild. Free spins – up to 100 with tripled winnings. Knockout Bonus Round. Nice guitar sound effects. RTP: 96%. One of the best online slots. Spy Game is a 5 reel, 15 payline, secret agent themed i-Slot. The best part is the exiting interactive game in game bonus round. The free spin wins have a nice x4 multiplier. Notice that there are additional Spy Game versions with lower payouts. RTP: 96%. Global Cup Soccer is a simple and fun 3 reel slot machine. The game was released for South Africa’s 2010 world cup. The only classic slot on the list. RTP: 96%. Bank Heist is the original Reel Crime slot. It is a 5 reel, 15 lines interactive video slot. Find your way inside the bank – 3 or more scatters trigger the next scene. The game quickly became one of Rival’s most popular slots and was followed by Reel Crime – Art Heist. RTP: 96%. One of the most complex slot games – and we say it in a good way. As the Reels Turn is a soap opera style slot with various characters, features and drama, drama, drama. Notice that there are 3 versions of this slot.